This past weekend I had to make the trip up to Minnesota to pick up my daughter from the University of Minnesota. I went up alone because Donna had to work. I sort of like these trips alone to get her for a couple of reasons. First, I get five hours of time alone to think, listen to music and ponder life. The other benefit is that it provides me with quality one-on-one time with Sarah both during the packing and on the drive back home. I miss having her around, so this is a great way to get us back on the same page after months apart. But there were a couple of other benefits this time. The first one was taking a side trip into downtown to drop off a copy of Dirty Shirt: A Boundary Waters Memoir at Subtext Books. They not only purchased a copy, but the owner mentioned that if it sold, she would order more copies through Ingram, a large distributor. Furthermore, it turns out she lived in Milwaukee for a time, so we had a bit in common outside of books. She told me she might be interested in having me do a reading there in the fall of 2016. So, in all it was a side trip I was glad I took. The other benefit was I had a few hours to kill before Sarah was done with her test. I took advantage of it to drive into the old neighborhood where I grew up, then park and walk around a bit. I am such a nostalgic geek, but part of the reason I was doing this was in the name of book research for my next memoir. I started by taking a roundabout way there which included going past the Selby-Dale intersection. This is the area where my father was killed. I cruised it for nothing more than morbid curiosity. It's weird the effect a place can have on a person's psyche. Of course it is wildly different than how it was in 1967 or even in the seventies when I passed through it several times. Wikipedia even says that in the sixties and seventies had some of the worst housing and crime in St. Paul. It was good to see the area in a state of healthy recovery. Then I went past my step family's house on Portland. This was after I discovered that that block of Portland Avenue is one way. That's new. For all I know it's been that way for 20 years. Anyway my step family grew up in this house and after they all moved out, the eldest daughter bought it and kept it in the family. A great old house. On the way to my house I drove down Summit Avenue, past the mansion of my high school friend Peter, which holds a ton of memories for me - mostly of just "hanging out" shooting hoops and killing time as a teenager. When Ben says he's going to "hang out at his friend Van's house," I totally get that. That was Pete's house. After passing my old grade school, St. Lukes, I passed the Greek Orthodox church, the focus of an entire chapter in the forthcoming memoir. I parked near my old house on Portland. 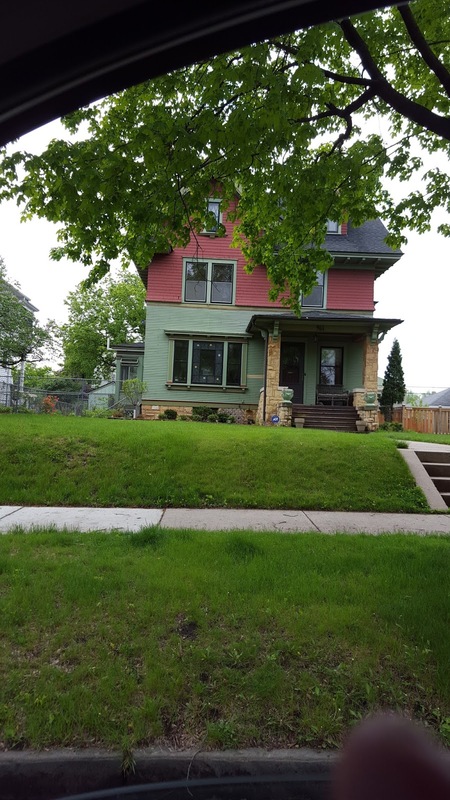 The new owners are in the midst of a major renovation of the porch and front yard, so I barely recognized the place. 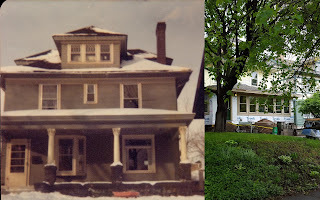 If I was looking for inspiration, it was clear I had to look to the second story, because the porch I grew up on is long gone. It was an unpleasant reminder that you can't go back. 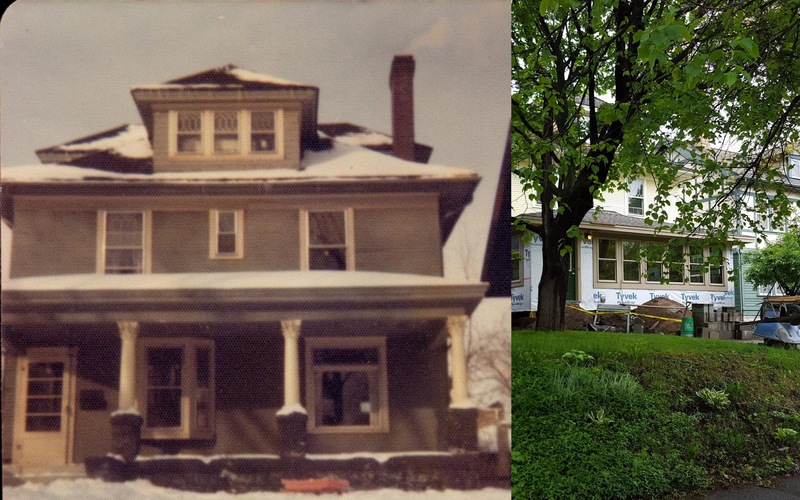 1121 Portland then and now. Then I strolled up the block and just waxed nostalgic. The sidewalk I walked on was the same on which I was pulled in a wagon behind a bike in a stunt that ended badly. Past the Naughton's house whose walk I used to shove. Ms. Naughton was so old it took her 5 minutes to get to the door every time I rang. She was sweet as could be and paid me richly. On past the Koenig's and Wrens' houses both families had eight kids I believe. Among many other kids, one or two of them would attend of our backyard Muscular Dystrophy Association carnivals. On the next block, I snapped a photo of my friend Pat's old house. His father died when we were in eighth grade, I believe, and suddenly I had a friend who I could relate to on a whole different level. I finished out the day with a trip up Summit Avenue and down Grand Avenue, both streets that get a good chunk of attention in the book. So it was a really meditative, reflective walk for me. Therapeutic and yet unsettling. The whole experience fueled my interest in finishing the memoir. Hopefully it'll be roughed out by year end. Looking farther than that is just messing with my hopes.